Corporate America has a real problem with short-termism. JPMorgan CEO Jamie Dimon and Berkshire Hathaway CEO Warren Buffett’s solution is to get rid of guidance, which would eliminate transparency and put companies at risk. Their solution also treats CEOs like a bunch of babies with no self control. In a Wall Street Journal oped out Thursday, JPMorgan CEO Jamie Dimon and Berkshire Hathaway CEO Warren Buffett suggested earnings guidance should be eliminated. They reasoned the reports incentivise CEOs to think too short term in an effort to constantly beat Wall Street’s expectations. How awful it must be for them. Being a CEO is hard, but it should be. They make a lot of money. So let’s talk about solving this very real problem with short-term thinking another way – a way that makes more sense for shareholders interested in transparency and good corporate governance. Instead of eliminating transparency, how about we reward CEOs for thinking long term? How about we teach people in business school that corporations are not just shareholders, but also employees and customers and communities? How about we change their payment packages to incentivise longer-term thinking? How about we expect CEOs to act like stewards instead of treating them like infants with no self control? Buffett and Dimon want to take away temptation, but what they’re proposing does nothing to solve our real, deep rooted problem with short-termism. That goes back to how CEOs are trained to think of companies from business school til the end of their careers – it has to do with who they think matters, and who they don’t think about at all. First things first: If you want CEOs to think long term, you should allocate stock-option awards around long-term performance and put some real clawbacks in place. Some real consequences may have made JPMorgan more vigilant during one of its most recent scandals that had nothing whatsoever to do with guidance – the $US6.2 billion loss the bank experienced in 2012 because of the rogue ‘London Whale’ trader. Dimon got a slap on the wrist for that foible. There were no real consequences, and it certainly hurt shareholders. The relentless drive to beat guidance (and earnings) quarter after quarter is just a symptom of a greater problem with shareholder primacy. In the 1970s, thanks to economic scarcity and some imaginative economists in Chicago, Americans started telling themselves the most important part of a company was its shareholders – and basically, only its shareholders. And that means the stock price has to stay up by any means necessary, no matter what it does to your employees, your community or your customers (see: Wells Fargo… or Facebook). And they used to do that, and believed that they should. In the first half of the last century, two professors, Adolph Berle of Columbia University and Merrick Dodd of Harvard Law, duked it out over whether companies lived for shareholders. Berle took the side of shareholders, and Dodd took a more holistic approach. 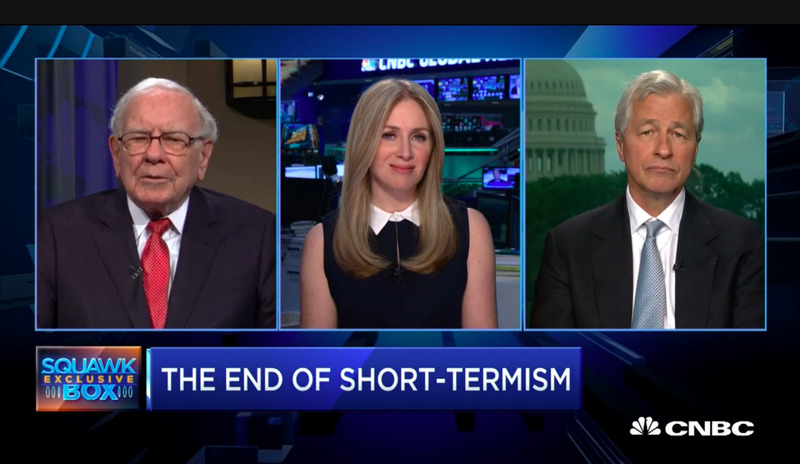 If you think of corporations that way – in a way that gives it a greater purpose in American society – you solve the problem Dimon and Buffett are talking about without sacrificing transparency. Stock price, you may be surprised to hear on a business publication, is just one metric by which we can judge a company. If shareholders are not the most important thing in the world, you will spend money on longer-term projects that build your customer base or keep your employees healthy and happy. We should be teaching that at business schools, we should be talking about it on CNBC, and in the pages of the Wall Street Journal. We should not be treating grown adults like babies.